Went out with the girls the other night (it's been eons since I've watched a movie in the theatre). We watched the Help. What a powerful movie! With transcendent acting and a moving story line. I came out feeling sad, but also a little more hopeful. Amidst all the hate and injustice, love still exists. And its our brightness and action which burns that light stronger. After all, change begins with a whisper, and becomes a roar when we decide to join its voice. 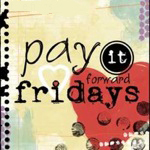 I thought it was perfect message heading into our Pay it Forward Friday. A message that says that our inaction may be just as strong as condoning the injustices we witness. One that says we can be part of the change, and there are no small battles, only ones we choose not to join. Have a great weekend, and remember our choices are what shape our lives and those around us. We are only free if we use that freedom to stand up for what we believe in.